Argos Productions‘ second excursion in Boston theater, Wandaleria, written by David Valdes Greenwood and directed by Brett Marks, was an exceptional presentation of a wonderfully written, funny play. The script itself is new. The Author, a former Boston Globe columnist and accomplished playwright, creates a piece that is not only exceedingly clever, but well structured. The story moves at a good pace, and the comedy is fresh and entertaining. The story centers around Wanda Mae Pretty and her relationships with her roommate Betsy, her niece Ivy, and her prison pen pal Rocky. Exploring the life of a woman who has not left her home in a long while, in a small town in Maine, the script maintains a light, humorous tone, punctuated by the moral of the story being laid out plain by the exceptionally realistic characters. The production itself is incredible. The light and set designs are fantastic. The use of different lights and music during Wanda’s fantasy sequences, occurring frequently throughout the play, create a visually striking representation of multiple realities, and keep the audience looking forward to when they will next appear, as the script calls for a series of hilarious fantasy sequences. The set design is simple yet highly detailed. Everything on the stage feels like it has a place, and the scene would feel incomplete without all of it. A fairly small performance space, the Boston Playwright’s Theatre creates an intimate atmosphere that drew me in and made me feel like I was a part of the world of the play, exactly as the director intended. The acting is slightly inconsistent, with many high points and a few lows. Kate deLima (Wanda) is exceptional, alternately invoking raucous laughter and heartfelt silence from the audience as she delivers her comedic lines with expert timing and her dramatic pieces with passion and intelligence. The stars of her fantasies, Craig Houk and Terrence Haddad, are also fantastic, and never failed to leave the audience clutching their sides. Peter Brown’s portrayal of Rocky, Wanda’s incarcerated pen pal and love interest is good, though it left me feeling that he had not quite gone far enough with his soft spoken Floridian criminal. He plays his part well, combining a soft spoken, quiet demeanor with a physically imposing presence (he’s the tallest actor on stage by at least 8 inches). However, I left not feeling that his character had ever fully been realized, though I still enjoyed him quite a bit. Shelly Brown (Betsy) and Caitlyn Conley (Ivy) portray Wanda’s close friends and relations to great effect, creating a family unit that was as real to me as my own. While no one is perfect, the few minor stumbles that they have in no way detract from the overall exceptional quality of their work. All in all, I loved Wandaleria. I’m not normally one for modern theater, but I have to agree with director Brett Marks in his hope that this becomes the first of many performances of David Valdes Greenwood’s play, and of his work on an even wider scale. 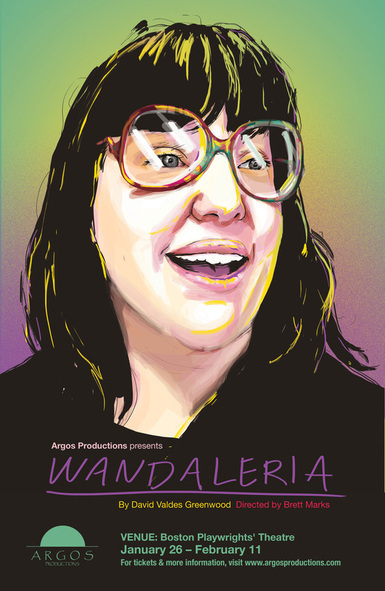 I heartily recommend Wandaleria, a warm evening of wonderful entertainment that is sure to continue to amuse and impress audiences for years to come, and I know that I’m looking forward to seeing more of Argos Productions’ work as they continue to go forward.